United We Om teacher Ora Sucov knows the joys and challenges of having a special needs child first hand. Her own grown son is on the Autism Spectrum. Ora is to thrilled to share tools from Yoga and Meditation that these young mothers can bring home with them and employ through the day as their special needs children grow. The mothers, fathers and medically fragile babies in this Karma Project are mostly from low-income and immigrant backgrounds. 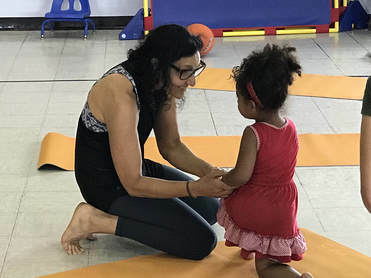 ​Although the positive effects of Yoga for special needs children are well documented, many children and families do not have access to it.